I like to make the cards that I give to people. Yes, I too often give in and buy the prefabricated ones, but even then, I try very hard to pick ones out that are blank inside, not substituting anyone else’s words for my own. I like the handmade touch. I have a small box with several cards that I made for my mom when I was a child. They are special. My mom treasured them enough to keep for herself and now, I keep them myself. 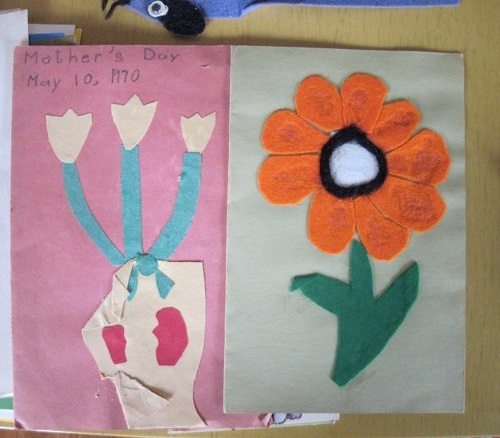 Crayon-scribbled, “You are the best mom” accompanied by a cut-out, construction paper flower is worth saving. A couple of cards that I made for my mom. Besides the sentimentality of handmade items, they also share the message that the sender took a bit more time to make something just for you. I’m not knocking the time one can spend searching the shelves at the Hallmark store for just the right message, but you must admit that taking the time to make that right message says just a little something more. I thought about making cards earlier this week when I followed along with a listserv discussion about the practice of sending weekly articles, messages, and updates to patrons. A number of participants shared some very helpful resources – aggregators, if you will – for delivering timely pieces. It’s both easy and resourceful to subscribe to them. They scour the internet for stories about the latest medical procedure, disease outbreak, trend in healthcare, etc., and send them right to your email inbox for quick reading. Some even annotate them for you, so that you don’t have to be bogged down reading more than seven paragraphs. The suggestion offered in the discussion was to share these feeds with administrators or doctors or researchers or whoever your target audience is. It’s a great idea, but as I thought about it, the practice reminded me of buying a greeting card instead of making one yourself. Libraries and librarians have given up a great deal of their identity (their brand) over the past years. The full-text of articles are often accessed through third-party vendors or the websites of journals, despite the fact that it’s one’s library that’s often providing the resource. We buy catalogs developed by other companies, rather than developing homegrown management systems. We embed RSS feeds from other sources into our own websites. And each and every one of these practices saves both time and money, but at what cost? I got to wondering how much time it would really take to subscribe to a relevant aggegator or journal table of contents, or to set up a few alerts from custom-saved searches, or to put together several Twitter lists that follow sources specific to a group or department I serve. Then I could use these tools to create my own, customized delivery of an article or an interesting piece of news to the same. Think of the return on the investment I’d get by sending a personal note directly to someone with the resource attached, as compared to the same coming from an automated – and branded by someone else – source. Now, I can already hear some naysayers saying, “I don’t have time to keep up with that.” Maybe not, but I think it might be worth a try. A full shelf of writing and reading, plus Finz. And an autographed baseball. And a holiday ornament. Librarians don’t need to be organized at home. Related, another thing that I often hear people say is that we don’t have time to read ____ (insert whatever it is that you don’t have time to read – blog posts, journal articles, interesting pieces from the news). Similarly, many say that we don’t have time to write _____ (insert whatever it is that you don’t have time to write – blog posts, journal articles, etc.). This a dilemma. To paraphrase Stephen King (the writer), if you want to be in the information business, you need to do two things above all others; read a lot of information and write a lot of information. How else can you stay on top of it? How else can you provide good information resources to those you serve? How do we call ourselves information professionals if we ignore the very thing that we’re supposedly experts in? We work in a fast-paced and rapidly changing profession. All the more reason to do those two things above all others. Read and write. Data Dictionaries, a blog post by Kristin Briney. If you’re charged with the task of managing data, at any level, Kristin’s blog is worth following and this particular piece is a great one to bookmark, because it’s really hard to find good posts and good examples on the topic. Your Two Kinds of Memory: Electronic and Organic, by Annie Murphy Paul. Medical librarians are forever grousing about a certain resource that’s ever-so-popular with doctors and medical students alike. Annie’s post offers an entirely different reason for concern. The Trouble with Medicine’s Metaphors is an article by Dhruv Khullar for the Atlantic. Khullar is currently doing a residency at the Massachusetts General Hospital and Harvard Medical School. Maybe it’s because I majored in philosophy, maybe because I love linguistics, maybe because I was in the hospital last week… for many reasons, I found this a great read. Finally, I always read Amy Dickinson’s advice column. I need all of the everyday, practical advice that I can get. And my friend, Suzy Becker, wrote a most wonderful blog post to go along with the release of her latest book from Random House Kids this week. Author-Daughter Book Club just about made me cry in my cubicle. In a good way. Moms of sons and daughters, both, will enjoy it. I give shout outs to these two writers who, many days, make my day.